On behalf of the Moving Day® Silicon Valley planning committee and community, we’d like to praise the Parkinson’s Pioneers who will be recognized for their contribution to neuroscience on Saturday, April 25. We’re touched that they will join us in celebration of movement at Moving Day® Silicon Valley, at Arena Green East in San Jose. Thank you to our sponsor Circuit Therapeutics for making this gesture of appreciation possible. –Darcy Blake, Chair, Moving Day® Silicon Valley 2015. Dr. Helen Bronte-Stewart, MD, MSE, FANN, FANA, is the Director of the Stanford Comprehensive Movement Disorders Center, where she and her colleagues assess and treat patients with all types of Movement Disorders. She also directs the Stanford Human Motor Control and Balance Laboratory, where she has developed computerized, quantitative measurements of human motor behavior, which are being implemented in a wide range of research in Movement Disorders. Her research focuses on the neural signature of abnormal movement in Parkinson’s disease and tremor. Dr. Kathleen Poston is Assistant Professor of Neurology & Neurological Sciences and (by courtesy) Neurosurgery at Stanford University Medical Center. She is a clinical movement disorders specialist and an imaging neuroscientist. Her research focuses on the development of novel neuroimaging biomarkers to improve diagnostic accuracy and monitor the effects of investigational treatments for Parkinson’s Disease and other movement disorders. Her current studies focus on cognitive and memory problems in people with Parkinson’s disease. Dr. Jun Ding is an Assistant Professor of Neurosurgery at Stanford University School of Medicine. His focus is to dissect the functional organization of motor circuits, involve the cortex, thalamus and basal ganglia at the molecular, cellular and circuit level. Dr. Xinnan Wang is an Assistant Professor of Neurosurgery at Stanford University School of Medicine. The focus at the Xinnan Wang Lab is to understand the mechanisms controlling mitochondrial transport and function and the mechanisms by which misregulation of mitochondria may contribute to Parkinson’s Disease. Dr. Simon Tan is an Assistant Professor of Neurology at Stanford University School of Medicine. His primary focus is on the cognitive and emotional aspects of Parkinson’s disease as it relates to deep brain stimulation. Dr. Veronica E. Santini is Clinical Assistant Professor of Neurology at Stanford University specializing in the diagnosis and management of movement disorders including Parkinson’s disease and atypical parkinsonism. She takes a holistic approach to patient care and hope to integrate conservative and alternative therapies where appropriate. Carlos Rodriguez, RN CNRN Nurse Coordinator for the Deep Brain Stimulator program at Stanford Health Care since 2011. The focus of my practice is to help Parkinson’s Disease patients with their evaluation for candidacy for the Deep Brain Stimulator surgery, manage their medications and perform their initial programming. What I really enjoy is seeing these patients go from struggling with just their medications to a better quality of life the moment their devices are activated. Dr. Samuel Goldman is a Preventive Medicine physician, an Associate Adjunct Professor of Neurology at UCSF and a Principal Investigator at San Francisco Veterans Affairs Medical Center. Almost all chronic diseases are caused by the combined effects of genes and environment. Dr. Goldman and his colleagues study environmental causes of Parkinson’s disease, and the interaction between genetic and environmental risk factors. The goal of this work is to develop strategies to prevent and slow the progression of Parkinson’s disease. Dr. Coralie de Hemptinne is a postdoctoral fellow in Dr. Starr’s laboratory at UCSF. She dedicates her work to understanding the neural basis of PD and the mechanisms by which DBS normalizes aberrant brain signals. She has shown that PD is characterized by excessive synchronization between populations of cortical neurons that is reduced by therapeutic DBS. This biomarker of the parkinsonian state could be used to improve PD therapies. Dr. Anatol Kreitzer is an Associate Professor of Physiology and Neurology at UCSF and an Associate Investigator at Gladstone Institute for Neurological Disease. Using optogenetics, he has identified key neural circuits that are disrupted in Parkinson’s disease. His seminal discoveries link changes in motor behavior in Parkinson’s disease with modifications in specific brain circuits of the basal ganglia. Dr. Krystof Bankiewicz M.D., Ph.D. is a Professor of Neurosurgery and Neurology, Kinetics Foundation Chair in Translational Research, Vice Chairman, Neurological Surgery, Director, Interventional Neuro Center, University of California, San Francisco. The Bankiewicz laboratory is a translational neuroscience group. “We create novel approaches for the delivery of therapeutic agents to specific target regions within the brain to develop effective treatments for brain diseases. Our work can be applied to many neurological diseases such as Parkinson’s disease.” Dr. Bankiewicz launched 2 ongoing clinical trials using gene therapy approach in Parkinson’s disease. Trials are recruiting patients at UCSF and NIH in Bethesda. Monica Volz is a nurse practitioner at UCSF Movement Disorders and Neuromodulation Center since 2003. She is experienced in the evaluation, care and programming of patients who have deep brain stimulation (DBS) for Parkinson’s Disease. She has had the pleasure of programming many Parkinson’s patients over the past 12 years and has formed a unique bond with her patients as they proceed through the journey that is DBS. Dr. Paul Larson is an Associate Professor and Vice Chairman of Neurological Surgery at the University of California, San Francisco. His research is focused on clinical trials of gene therapy for Parkinson’s disease and interventional MRI-guided deep brain stimulator implantation. The group at UCSF was the first to develop asleep, MRI-guided surgery for DBS, and they are the most experienced center in the world for both MRI-guided surgery and gene therapy for PD. Dr. Gary Heit, Neurosurgeon at Kaiser Permanente Redwood City created and ran the Functional Neurosurgery program and helped pioneer the deep brain stimulation treatment to treat Parkinsons disease. Dr. Heit co founded Americare Neurosurgery International, providing neurosurgery internationally. Dr. Rima Ash is a Movement Disorders Neurologist at Kaiser Permanente, San Francisco. Her focus is on Parkinson’s disease, Deep Brain Stimulation, and community support. Her goal is to make the Parkinson’s disease community well informed about their disease and treatment options. She hopes that she can provide her patients with a positive outlook and give them the tools they need to play an active role in managing their own disease. Dr. Melanie Brandabur served as the medical director of three separate National Parkinson Foundation Centers of Excellence; at University of Illinois, at Alexian Neurosciences Institute and at the Parkinson’s Institute. As a clinician, Dr. Brandabur offered a multidisciplinary approach, with an emphasis on exercise and nutrition, in addition to medication. Dr Brandabur served as an investigator in over 50 clinical trials for Parkinson’s disease. After over twenty years of experience as a clinician and clinical researcher, Dr. Brandabur accepted a position as Medical Director at Ultragenyx Pharmaceuticals in December, 2014, where she works on the development of therapeutic agents for rare diseases. Daniel Zwilling, Laura Leung, Barbara Nguyen-Vu, Kim Thompson, Steven Braithwaite, and Ian Gallager are scientists who work with a team of scientists from Circuit Therapeutics on therapeutic neuromodulation of neural circuitry through the power of optogenetics. Using light-based control of genetically altered neurons, they are opening paths to drug discovery and development, and forging therapeutic applications. 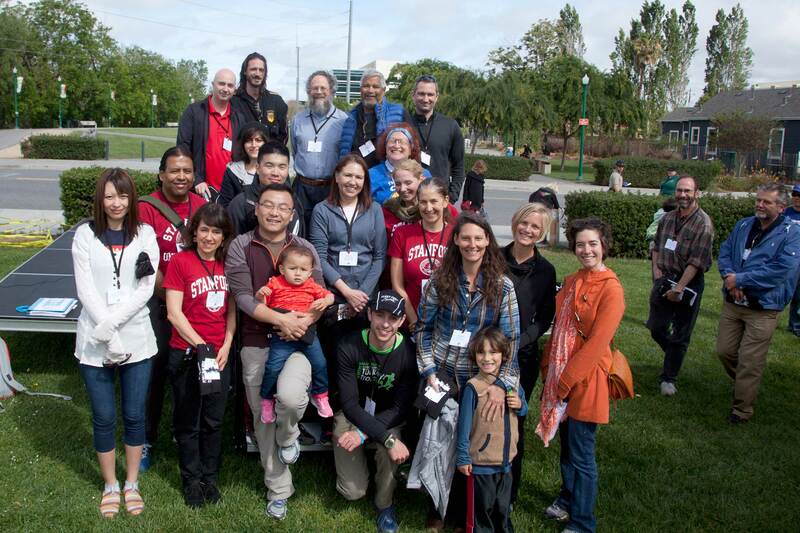 To join the community in praising the Parkinson’s Pioneers, register for Moving Day ® Silicon Valley!